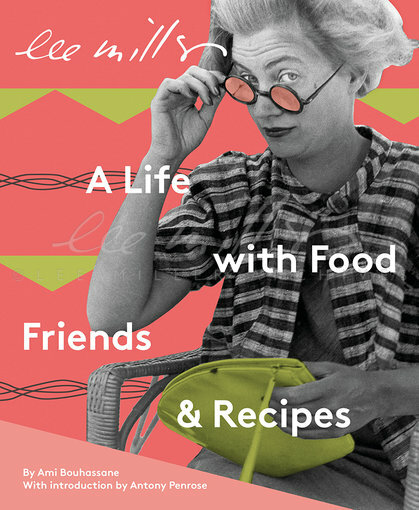 Gold award winning Lee Miller cookbook: Lee Miller: A Life with Food, Friends & Recipes by Ami Bouhassane has just won the cookbook category at the IPPY (Independent Publishers) awards, America. Award winning cookbook with a difference! Written by Lee Miller's granddaughter it is more than a book of recipes, this cookbook explores Lee Miller’s life through the influence of food and how it ascends to becoming the creative vehicle that she eventually swaps her camera for and uses to build bridges, heal old wounds, and to empower other women. A woman of many lives and mistress of her own re-invention the legendary Lee Miller, model, surrealist and fashion photographer, war correspondent and gourmet cook does everything wholeheartedly and with an imaginative flair. Much has been written about the varied forms of her creativity but Lee Miller's achievement as a gourmet chef is usually left to being an endnote. Her granddaughter Ami Bouhassane sees this part of her life as Miller's longest battle and most extraordinary personal accomplishment in every sense. Illustrated by both new photography and that of Lee Miller and Roland Penrose the book contains over 100 of her recipes as well as images not previously published. Many of the recipes come from the cookbook that Lee Miller was secretly writing herself at the end of her life that would have been called 'The Entertaing Freezer'. To understand properly the importance of Lee Miller’s reincarnation as a chef it is important to understand her life story in the context of food and its influences behind her cooking. Lee Miller credits Man Ray for not only teaching her about the art of photography but also how to enjoy and appreciate good food. She also experiments with the idea of food as protest against the objectification of women’s bodies. She relished dishes and ingredients from all over the world and drew inspration from the countries she'd travelled to and life experiences. Post war the effects of what she had witnessed as a WWII correspondent during touched her deeply and she experienced what would today be diagnosed as post-traumatic stress disorder. She struggled with depression until through her fascination in food she re-invented herself as a gourmet chef and found a way to recover. Creativity hit her table with beautifully prepared dishes such as Muddles Green Green Chicken, Upside Down Onion Cake, Cauliflower Breasts, Gold Chicken and Pink Heaven. Lee Miller died at Farleys, East Sussex in 1977. She made very few bequests but as cooking such a part of her life it was important to make sure that the books lives continued after her death. Her 2,000 cookery books and magazines were left to Westminster Kingsway College, a college with a great gastronomic reputation and that amongst others boasts ex-students such as Ainsley Harriet and Jamie Oliver. She knew her books would continue to live on, to inspire and enable new chefs.